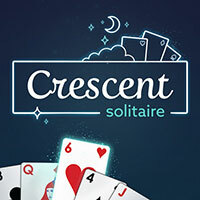 Crescent Solitaire is an exciting new take on the classic game, played with two decks. Can you control the chaos of the crescent? It is a free online game that’s a new take on an old classic solitaire. In Crescent Solitaire Game you start with aces and kings in play and must pull cards from the crescent above instead of the deck. Stack cards of the same suit in ascending order on the aces and descending order on the kings. From kings to aces and aces to kings, try to contain the chaos of Crescent Solitaire! Enjoy and have fun in playing this free online solitaire game. Good luck.